Can dogs eat Corn on the Cob or is the Cob itself really dangerous? Nothing says ‘summer’ like fresh, sweet corn on the cob. 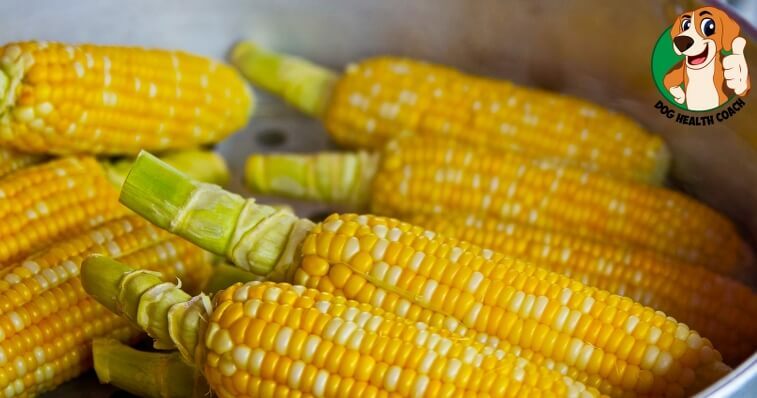 Corn on the cob (also sometimes known as ‘pole corn,’ butter-pop, long maize, corn stick, or sweet pole corn) is a cookout staple all over the country, and can be enjoyed plain, or loaded up with butter, salt. Some people like to grill their corn on the cob, while others enjoy it fried, boiled, or roasted. But, is corn on the cob safe for dogs to eat? The answer is yes for corn, it is NO for the Cob! Corn itself is actually commonly found in many dog foods, and even if you make homemade dog food, corn can be used as somewhat of a ‘filler.’ Dogs can even eat corn nuts! While corn itself absolutely shouldn’t be the main staple of your dog’s diet, there is nothing harmful or toxic about corn when it comes to your dog ingesting it. Be careful of Corn Cobs with your dog! The danger with corn on the cob comes from the cob itself. While it doesn’t contain anything that can be harmful to your dog, the shape of the cob can become the actual problem. If your dog is able to ingest a large piece of the cob, it can actually get lodged inside their intestine, causing abdominal issues, pain, and trouble digesting. At first, it can lead to constipation in your dog, but if the problem doesn’t clear up, you may need to take your dog to see a vet as soon as possible. A good rule of thumb is to scrape the corn from the cob before giving it to your dog, or monitor the way they might be eating it to make sure they don’t ingest the cob itself. Looking for more healthy vegetables your dog can enjoy? Check out our extensive list, and learn more about the benefits of fresh vegetables for your four-legged friend.